When it comes time to get a new air conditioning system installed in your home, it can be a frustrating and confusing process. There are so many different options to consider and we here at Quality Air Heating and Air Conditioning wanted to make the process a little easier. Read on below for our quick guide to air conditioning installation in Columbus, OH. Give us a call today if you need any kind of services for your AC whether it’s installation, repair or maintenance. Check out our guide below for some of the options to consider for your new air conditioning installation in Columbus, OH. Get professional help – Ensuring that you schedule a high-quality air conditioning installation is one of the best ways in which you can enjoy an efficient, long-lasting performance from your new AC system. Working with a qualified contractor can ensure your system will work properly and at maximum efficiency. Type of air conditioner – There are a huge rang of air conditioning systems that are available to consumers. The right one for your home depends on your needs, your property and your energy goals. For example, geothermal systems are a great way to reduce the amount of energy that you have to buy to cool your home. However, they require that you have a certain amount of space on your property for their installation. There are also ductless mini split air conditioning systems that allow homeowners to ditch their ductwork and cool each area of their home with separate wall-mounted units. Central air conditioning systems are a very popular and effective option. Talk with your installation contractor and they can help you figure out which system is right for you. Efficiency rating – All air conditioning systems are given an efficiency rating like a SEER (seasonal energy efficiency ratio) that describes how much cooling they provide and home energy they use. The higher the SEER rating the more efficiency the system is but usually the cost is also higher with more efficient systems. Make sure that you stay within your budget when it comes time to buy a new air conditioning system. 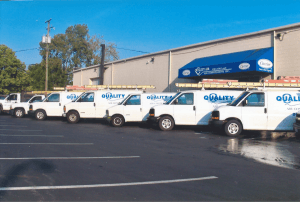 If you need any help with air conditioning installation in Columbus, OH just call the specialists at Quality Air Heating and Air Conditioning.